Strolling through Ljubljana is like walking through a medieval fairy tale, the result of a castle, smack downtown, overlooking the city and of the neo-gothic creations of Joze Plecnik. 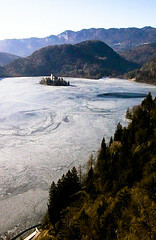 Bled also reminded me of fairy tales, of a time where dragons, princes and damsels in distress were at the center of attention. 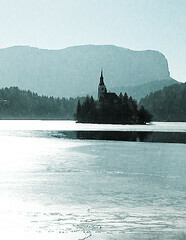 Bled is a lake, surrounded by mountains where, in winter, skiing is possible. 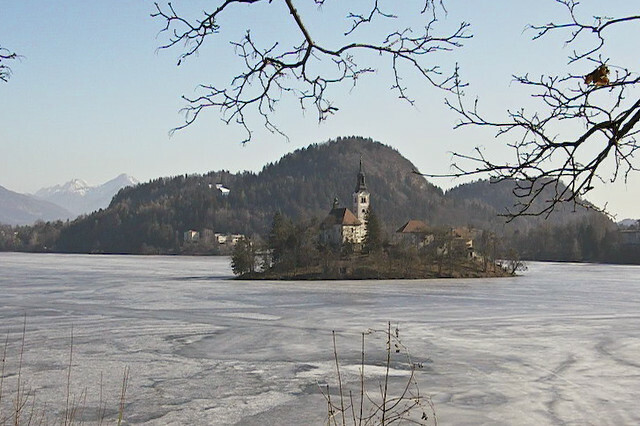 In the middle of the lake there's an island with a tiny village, not much more than a church and some houses around it, its spire trying to match the mountainous terrain, but no match for it. 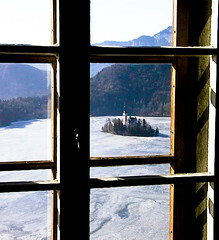 On one of the mountainsides surrounding the lake, a castle gives you a great view of the area. 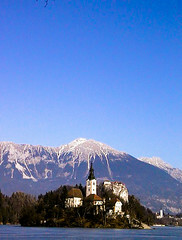 In Lesce-Bled, where I got off the train and waited for my bus to show up, I chilled in the stations restaurant. In a separate room, the 'mini-casino', a fuzzball table, a pinball machine and an arcade machine were installed to entertain the wary traveler. A big picture of New York's skyline was hanging on one of the walls. Someone had cut out two paper airplanes and had stuck them behind the glass. One had already entered one of the twin towers, the other one was making its approach, following a line of arrows pointing into the other tower. Together with a Japanese guy, Tong, who staid at the same hostel-come-Panzion, I had a beer upon my arrival, in a busy tiny pub with a beautiful girl behind the counter. David, a Slovene living right next to Bohinj lake which supposedly is even prettier than lake Bled, heard us speak English and, surprisingly, concluded we had to be foreigners. According to David, we just HAD to stop by his place the next day, on the free ("You know, we'll party, visit girrrrrls"), but when some minutes later, on passing he mentioned $100 as a reasonable price I quickly lost interest. Tong had already gone and David soon followed suit. I was told I HAD to call him the next day. I asked Petra, the girl behind the bar if it would be smart of me to call and the look on her face told me she couldn't choose between being nice to her fellow countryman or be honest. Only when I insisted did she say "I don't think you should call him." The next day, when I bought myself another beer at Petra's, David didn't show up and I started chatting with Peter, working in a hospital, he was crazy about skiing, climbing, kayaking, rowing and other sports that give one a great physique. In some disciplines, he was a trainer too. What was next? An IQ of 180? While enjoying a local specialty, blackberries in blackberry licquor, he couldn't stop talking. 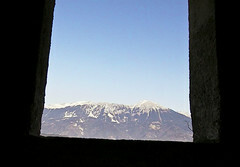 Peter, too, had climbed Triglav. 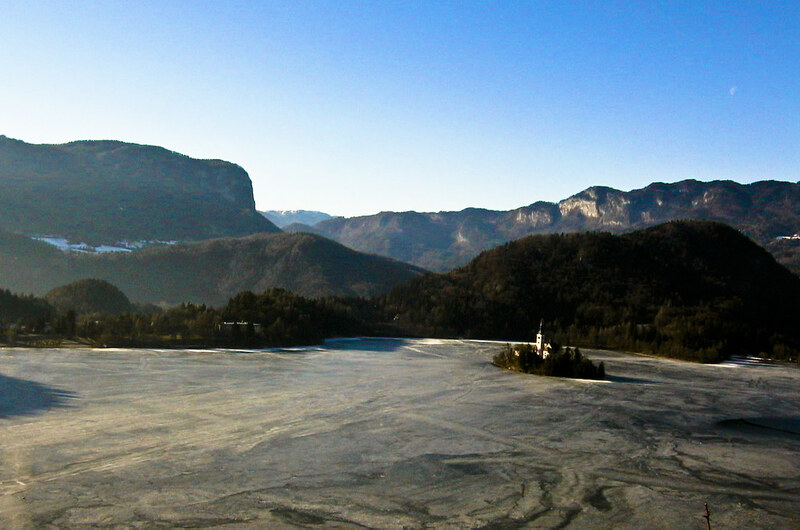 Triglav is a 3000 meter high giant mountain in the north of the country. 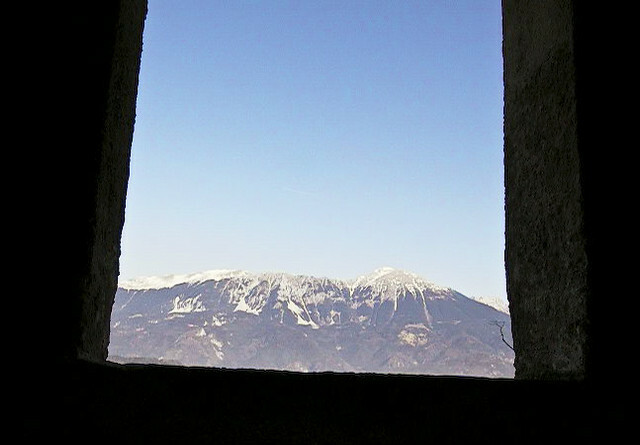 The first Slavs thought that the mountain was inhabited by a three-headed god, ruling over the sky, earth and underworld so no-one dared climbing it until late in the 18th century. 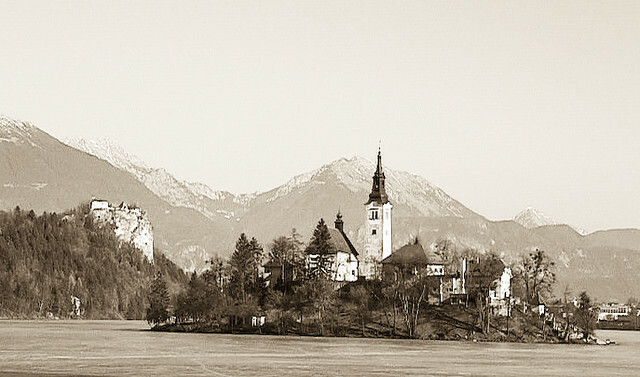 Under Habsburg rule, in the 19th century, climbing the mountain became something of a pilgrimage, a confirmation of a Slovene's identity as a Slovene. Today, it's still considered a must for every Slovene to climb the mountain at least once in his lifetime. 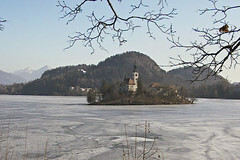 Later, after Petra's, in another bar, a lady told me that in winter, like in summer, Bled is also covered with tourists. I hadn't noticed yet and the fact that all the 20 people or so that entered the bar after me where known to the lady in question didn't really confirm her statement. The day after I arrived, I walked around the lake and visited the fort. Getting into the fort requires an entrance fee. Not unreasonable, although it even applies if you want to visit the restaurant. The money is worth it, though: the view is really fantastic. 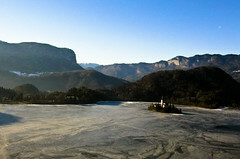 It was February, the lake was frozen, stretching out in front of and below me. Sitting on one of the fort's terraces, I enjoyed the winter sun to the fullest. Walking around the lake should take you about an hour. It took me five. The weather was so great there was no rush whatsoever, the sun inviting me time and again to sit down and let time flow by. Returning to Bled, I enjoyed a local specialty, the Kremna rezina, a piece of pie with lots of cream and sugar. It felt like swallowing a brick. While enjoying a beer in Slasecarna Simon a father with his four-or-so year old daughter entered the bakery. Red curls, doll-face, dark, tiny shining eyes, the girl reminded me of Shirley Temple. her father ordered an icecream-dipped-in-chocolate for the little lady and, smiling from ear to ear, she accepted the gift. Licking the icecream as if her life depended on it she finished it quickly, licked her lips to make sure she had gotten every last bit of it and ended her ceremony with a big kiss in the air. "Icecream", she said, "I love you".